Well, I have been working hard on this site, and after getting the design right, and the mechanics of the site working, I was able to fine tune the content. 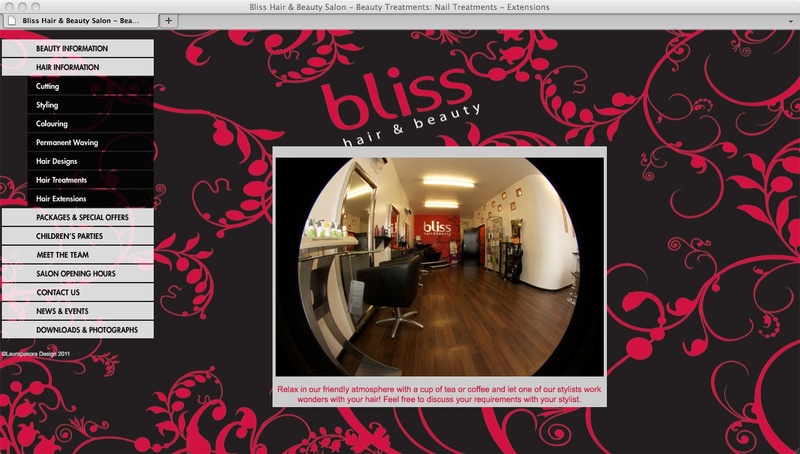 I spent a few sessions at the salon during opening hours, getting some photos taken, and gathering the information that the customers needed and wanted. 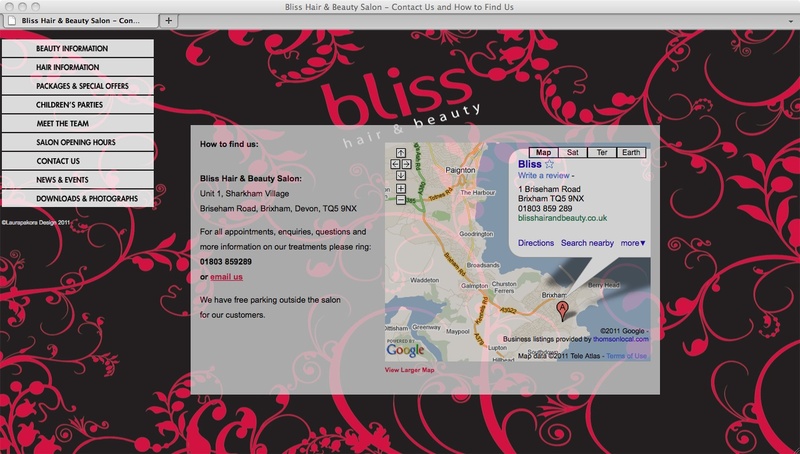 We put together Aftercare Leaflets, as well as pricelists for the different products sold at Bliss. I also took some photos of the salon – and tried to make them a bit more interesting than your bog-standard photography by using a fisheye lens. 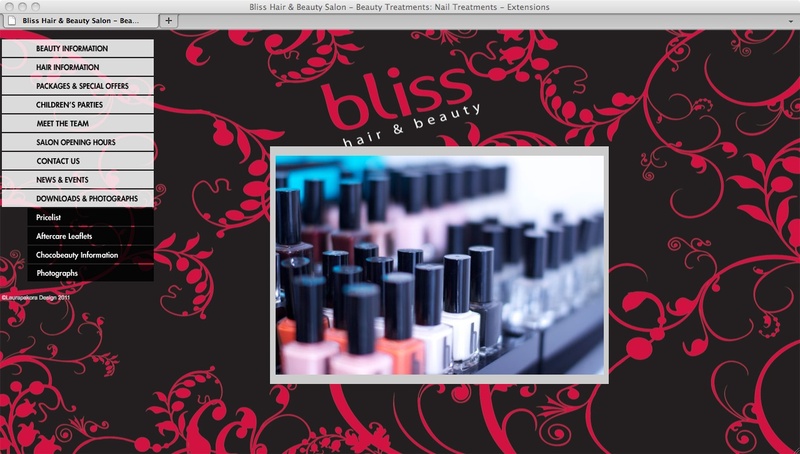 Bliss is not an ordinary salon – and I wanted that to show in the photos. I tried to capture the professional aspect of the salon, whilst still maintaining the relaxed and friendly atmosphere. I think the photos add a interesting twist to the website – it was looking a little bland without them – every page looked very similar. I have used the brand colours – black and red, and white on the website, using bold red type for all the links. The background image is made with the supporting graphics of the brand. I think the black and red helps to make the site seem luxurious and professional. The navigation is a lot easier than the previous website, the treatments are split into hair treatments and beauty treatments, and then subdivided. All the other information is under different headings to differentiate it. The important information – the pricelist (with small descriptions of each treatments), aftercare leaflets and pricelists are all available as downloads to make things easier for the user. 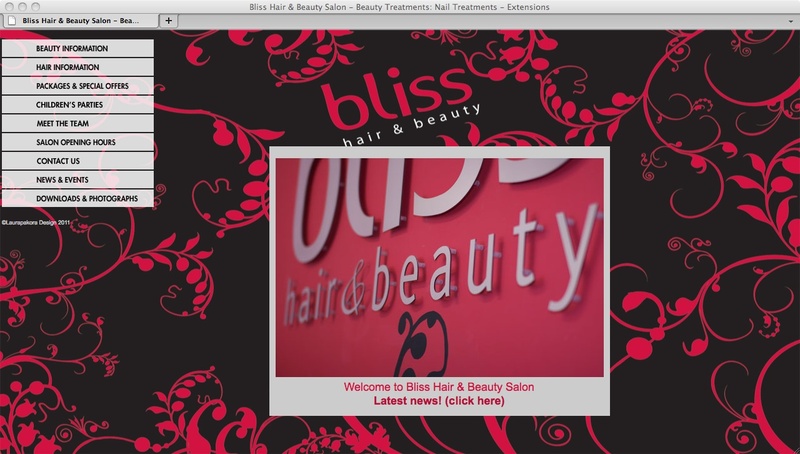 We have put a google map on the site to help people easily find the salon, and published the up-to-date opening times and prices to ensure clients are well informed. We swapped the site over from a Flash site to an HTML site to make it a lot more accessible – especially for apple products! The salon have already had several new clients from the site – and many compliments on the updated site – especially the photography!